I later discovered that Matthew’s opening was pregnant with promise and hope. We miss the significance of Matthew’s announcement when we fail to read it in context. Like trying to follow the storyline mid way through a movie, we cannot appreciate the significance of how Matthew links the Old Testament with the New. Four hundred years after the close of the Old Testament, Matthew announces to the Jewish people that their long awaited Messiah has arrived! Someone rightly said, “The Old Testament is the New Testament concealed, and the New Testament is the Old Testament revealed.” The point being that the Bible is all one book that tells the story of the Lord’s great rescue plan to save His people through Jesus Christ, His Son. Jesus wasn’t born at a random time in history, but as Paul says so clearly in Galatians 4, He was born “when the fullness of time had come.” In other words, Jesus was born according to God’s great plan and in His perfect timing. The writers of the Old Testament continually spoke of One who was to come, of a Messiah who would deliver God’s people from their enemies. We read in Genesis 3:15 about a descendant of Adam who will crush the head of the serpent but who will also suffer a mortal wound. Later we discover through God’s promise to Abraham, that One will come who will be a blessing to all of the nations (Genesis 12 & 15). The Abrahamic Covenant is then linked with God’s promise to David that His descendant’s throne will last forever (2 Samuel 7). As the story of the Old Testament continues to unfold, greater detail is given about the Messiah who is to come (for example, see Isaiah 7:14, 9:1-7; 53; 59:1-21). Jesus will later say that all of the Old Testament prophecies ultimately pointed to Him (Luke 24:44). The beginning of Matthew, as well as all of the Messianic prophecies, reminds us that the Lord is sovereignly orchestrating the course of history according to His purposes. This Christmas we are reminded that Jesus came as a lamb in order to take away the sins of the world (John 1:29), but He also promises to return as a lion in order to defeat evil and establish His kingdom on earth (Revelation 5:5). of God? His grace and mercy? Read any of the Messianic prophecies about the birth and ministry of Jesus. How does understanding prophecy enrich your faith and strengthen your confidence in God’s Word? Jesus, the long-awaited Messiah, was born just as the prophets promised. We are also assured that He will return one day (Matthew 25:1-46). What do you think it means to live with a confident expectation of His coming? What would you do differently if you knew He was going to return next month? Download a hard copy of the week 1 devotional here. 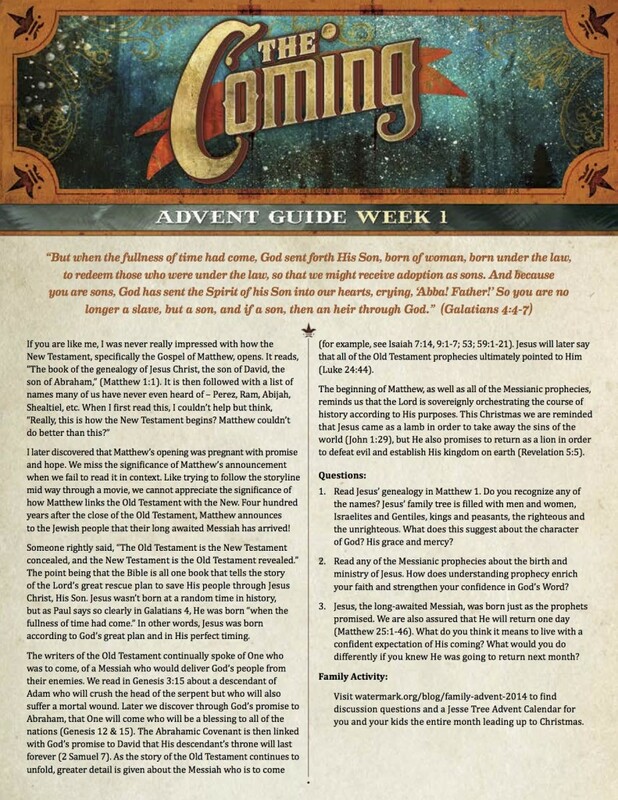 The post Advent Guide 2014: Week 1 appeared first on Watermark Community Church Blog.